The central nervous system (CNS) has an elaborate network of innate immune cells that respond to infections. To learn more about the mechanisms involved in programming these cells, researchers led by Dr. Dorian McGavern of the National Institute of Neurological Disorders and Stroke, National Institutes of Health, used Imaris software to study the innate immune response to a virus as it became established in a living mouse brain. Their findings could lead to therapies that help reduce the destruction that is sometimes caused by inflammatory responses induced by viral infection. To view the cellular dynamics that occurred during a viral infection, the researchers conducted intravital imaging experiments on anesthetized mice. They thinned the skull bones of the mice to view the brain and imaged it with a two-photon microscope. Static 3D images were acquired using a z step size of 1 micron up to 100 microns beneath the skull bone, and 3D time-lapse images at the same depth were acquired with a z step size of 2.5 micron and a 1 min time interval. Imaris was used for quantitative analyses of the two-photon data. “We have worked with Imaris for many years to conduct 3D/4D image analysis and found it to be user friendly and able to extract quantitative information from most of the imaging data sets we obtain,” Dr. McGavern said. In brains that have not encountered an infection, microglia are highly branched. When activated in response to an infection, these immune cells retract their processes and enlarge their cell bodies. First, the researchers identified GFP-labeled microglia by using the Imaris Spots detection algorithm to identify all the cell bodies in a given volume. They then randomly selected individual microglia for further analysis. To determine the state of microglia activation, the researchers used Imaris Filament Tracer to quantify the branch length and complexity of individual microglia in the brain before and after viral infection. The researchers measured the length and complexity of microglia processes with Imaris by identifying branch endpoints, bifurcations, and initiation points on each cell and connected them using Filament Tracer. Using the resulting tracings, they calculated the total process length and number of terminal branch points per process. This analysis revealed a statistically significant reduction in microglia branch length and complexity 15 days after infection, which indicates activation. Imaris software was used to quantify microglia branch length and complexity. 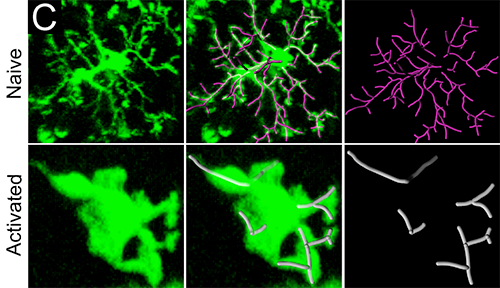 The upper panels show the branch complexity of representative microglia from uninfected mice versus day 15 infected mice in the lower panels. Reprinted from Nayak D, et al., PLoS Pathog 9(5):e1003395. Genetic studies showed that type I interferon induced all gene expression in the virus-infected brain. To take a closer look at this pathway, the researchers quantified microglia activation as described above as well as the scanning activity of circulating monocytes after infection in mice with and without the type I interferon receptor. To analyze monocyte surveillance of the virally infected brain, the researchers calculated the volume of individual blood vessels by using the Imaris Surfaces object creation tool to generate volume renderings of blood vessels. Dividing the number of monocytes in individual vessels by the volume provided the number of cells per mm3 of blood vessel. These analyses showed that the virally infected brain was completely silent in the absence of the type I interferon receptor. Overall, the research revealed that all gene expression and innate immune cell dynamics in the virally infected brain depended on type I interferon signaling. This finding was unexpected because biological systems typically have redundancy, meaning that if one pathway becomes inactive another takes its place. Earlier this year the researchers published an Annual Review of Immunology paper reviewing new findings that advance the knowledge of microglial biology. Included in the review were dynamic imaging studies that applied Imaris. The investigators also recently published research in Nature that used Imaris to help reveal new details about the dynamics of inflammation and the mechanisms that cause cell death after traumatic brain injury. Research paper: Nayak D, Johnson KR, Heydari S, Roth TL, Zinselmeyer BH, McGavern DB. 2013. Type I interferon programs innate myeloid dynamics and gene expression in the virally infected nervous system. PLoS Pathog 9(5):e1003395.